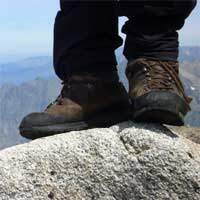 Home > Walking for Beginners > What Do You Want from Hiking? People start walking for a number of different reasons. It can be for the health benefits, which are numerous, to be greener in their lives, or simply for the pleasure that’s to be had from spending a day exploring the countryside. It can even be for a combination of those factors, and many more. Ultimately, what’s important is that you’re getting out into the open air and the countryside and enjoying it. Before you start kitting yourself out in fleeces, boots and backpack, though, it’s worth taking some time to consider what you really want from walking. Has your GP suggested you get more exercise to lose weight, or just to become fitter? Do you feel you’d benefit from the recommended thirty minutes of exercise, five times a week? Whilst for many hiking won’t really elevate the heart rate, especially if you stick to flat terrain, walking definitely does offer the kind of good, easy exercise most people can undertake. However, before you undertake an exercise programme of any kind, talk to your GP. Do you want an easy stroll, or do you want to gradually push yourself and tackle steep slopes? You’ll get more return from that, of course. But an ideal country walk should offer a mix of terrain, some hills, some flat, for you to give yourself a full workout. On average, people walk at two-and-a-half to three miles an hour, so to have a greater cardiac effect, you’ll need to force yourself to walk faster, at a pace that’s just on the edge of comfort – although you should never overdo, it of course, on both distance or time. Even experienced hikers need to work their way back into shape after the winter. Do you want to use walking to lose weight? Do you want to walk to become fitter? Have you set reasonable goals – remember, nothing is going to happen overnight. Have you discussed walking with your GP? What are the good ways to be on your feet and green? Being green is a lifelong exercise – do you want to commit to that? Do you want walking to be part of a larger green strategy in your life? Walking can be one of the most enjoyable activities, and it’s certainly one of the cheapest hobbies. You can get by without special equipment; all you need are your two legs. Britain has some of the loveliest and most varied countryside in the world, and hiking is the ideal way to experience it. Far more than the health benefits is the sheer joy of standing on top of a hill you’ve conquered and taking in the vista, or the pleasure in seeing a valley open up in front of you. It can become an addictive hobby, but with the country in easy reach of most of us, it’s one that is easy to pursue – and one in which you can learn a lot about nature, whether you go on your own or as part of a rambling club. Take your time, become used to hiking first – don’t go booking that walking holiday yet! Do you want to walk alone or with a group? What areas of the country do you want to explore? Apart from the pleasure of walking, do you also want to learn about plants and birds? Walking is an ideal way to spot them. Regardless of the reason for walking, there’s a great deal of pleasure to be had from using shank’s pony, especially if the weather’s good. But even if it rains, remember, you might get wet but you won’t melt!